It is all well and good to organise international events like the Dili International Marathon 2010 event, but thought has to be given to their environment impacts, reports Mallika Naguran. Dili, 25 June 2010. How do you get a nation in strife to lay down their differences and work together in harmony? By giving them impetus to surmount personal disabilities and social incapacities, and start believing in a better life - through international sporting events! That’s what the President of Timor-Leste Jose Ramos-Horta had envisioned for the newly independent nation, a series of sporting and adventure-related events that will propel Timorese’ aspirations higher than ever. The Dili International Marathon 2010 held on 20 June with more than 1,200 runners from 28 countries was a huge success amid hiccups. It was the first in the line of four major events in Timor-Leste this year to act as the fountain of hope primarily to youths. The other three: Tour de Timor, Underwater Photo Contest and Adventure Race. “Through sports, we encourage the youths and their families to consolidate peace in this country,” said Dr Horta, also a Nobel Peace Prize laureate. He noted that in the last two years, the sporting events have had positive impact on the minds of the people. “Sports also helps build cultural affirmation, improve identity and instills pride within the community,” he adds. Timor-Leste, formerly known as East Timor, is slowly rebuilding its social fabric and physical infrastructure after it voted for independence, ending 24 years of brutal military Indonesian rule. Winners all. Kenyan Philemon Rotich (middle) stands next to Augusto Ramos Soares, Zeferino Guterres Magalhaes and Rosa Mota, Olympian from Portugal. Winning Timor-Leste’s historic marathon was 29-year-old Philemon Rotich from Kenya. The father of two said he was greatly challenged by the hot climate, but otherwise thought the country and its people were beautiful. Interestingly, he had sought out the Dili marathon at random: He had searched the Internet to participate in a marathon somewhere foreign. And something clicked. Timor-Leste sounded far enough, but the travelling time bore him down. “I flew 14 hours into Singapore before connecting another three and half hours to Dili, and felt tired and almost turned back. 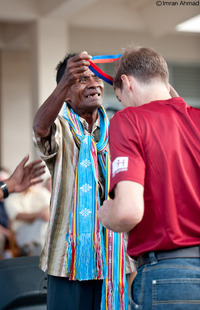 But prayers kept me going,” said the lanky runner who completed the race in 2:34:57 hours to grab USD5, 000 cash prize. 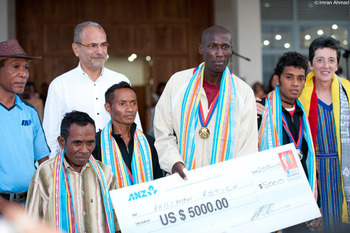 Next year, the prize money for Dili Marathon to be held on 18 June 2011 will be upped to USD15, 000, the President said during the prize presentation ceremony held at The Presidential Palace. Hopefully next year's event would be better organised: this year’s 10km race was foiled by a poorly informed race warden who erroneously directed runners back to the starting point, which meant, most had to re-start and run further than intended with timing going completely out of whack. There was feedback on the lack of drinking water stations plus “weird tasting isotonic water”. However, Nuno Delicado, a full marathon participant from Singapore, gave it a thumbs up, telling Gaia Discovery that the event organisation was "not far from the fantastically organised New York City marathon". Around 600 Timorese, young and young-at-heart, able and not so physically able, participated in this inaugural athletic event with lots of help from volunteers, many residents in Timor and foreign NGO groups. Bruce Bennett volunteers with a push. Trailing not too far behind the Kenyan were Timorese own top talents: Augusto Ramos Soares and Zeferino Guterres Magalhaes came in second and third with the following timing: 2:36 and 2:36:28 hours. Australian Lucie Hardiman took top spot in the woman’s category with a timing of 3:03:32 hours. She was followed by Timorese Juventina Napoleao 10 minutes later. Training to put Timorese on the marathon map began early. From an overwhelming 402 local registration early this year, 20 male and 20 female runners were eventually selected for the national squad team in March 2010. The team went through an intensive three-month program of “training, nutrition and team-building”. 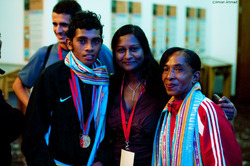 The squad was coached and mentored by Timorese Olympic marathon heroine, Aguida Amaral. She has competed in several Olympic and international marathon events and used her experience and passion to inspire and train young Timorese athletes, including her own children who clinched top places in this year’s Dili marathon event. Another inspiring personality was a decrepit Timorese who limped the entire 42km race to roaring applause and cheers from locals and foreigners at the finish line. 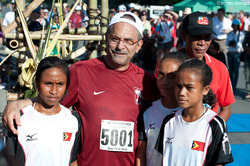 Alcino Pereira - Hero of Dili Marathon 2010. Alcino Pereira is no closet figure when it comes to his disability; in spite of a severe limp, he has been seen training daily for the race of the year. “This man is my hero,” exclaimed President Horta, adding that he felt ashamed for walking only 5km on the same day. Plastic mineral water bottles, canned drinks, food in plastics and Styrofoam packaging were distributed to runners and organisers at the end of the race. With lack of bins, and no sight of recycle bins, litter ensued. Captain Shane Granger of The Vega, a humanitarian vessel anchored off Dili told me that he woke up the next day to a sea of plastic bottles bobbing around his boat. “It’s a shame,” he said. Timor-Leste is yet to have a waste treatment plant, let alone recycling facilities. Waste, including inorganic materials, is dumped into the ground, leading to mounds of stinky landfills scattered across the picturesque country. And plastic bottles factor high on the rubbish list, more so with the advent of foreign workers and tourists. As Timor-Leste gears itself for sustainable development, it should earnestly adopt strict environmental policies and practices with the organizing of events and festivals as well. Large-scale events especially and international festivals should be organised with environmental impact in mind, starting with waste management. Plastics can, and should, be avoided altogether. Alternatives exist. Running for the joy of Timor-Leste! Think - how did Olympians in the days of old manage anyway? Plus, arrangements can be made, for instance, to ship out plastics, cans and glass to the nearest port with reliable recycling facilities. The writer with heroine Aguida Amaral and her son. Getting Timorese to chip in with the organizing of cleaner and greener events will certainly help foster greater love for their homeland, a definite step towards fulfilling President Horta’s vision of a secure, peaceful, beautiful and sustainable nation. Photography courtesy of Imran Ahmad of Escape Inc. Here are some references and tips on running greener events and festivals. A Greener Festival recognises events and festivals with awards and honours. Waste Management.